The Institute on Metropolitan Opportunity’s work recognizes that at least 40 percent of the U.S. metropolitan population resides in suburbs with social or fiscal challenges severe enough to be considered “at risk.” The many challenges facing these metropolitan areas can be attacked effectively only through coordinated, regional approaches to planning, housing, education and economic development. Through top-level scholarship and mapping, IMO continues to investigate the ways that laws, policies and practices affect development patterns in these regions, then provides practical resources and recommendations for reform for policymakers, planning officials and community organizations. The Institute on Metropolitan Opportunity began as the University of Minnesota Law School’s Institute on Race & Poverty (IRP), founded by john a. powell in 1993. The IRP focused its efforts on creating greater understanding of racialized poverty and changing policies and practices that affect the well-being of low-income communities of color. It collaborated with many advocacy groups and community organizations; national, state and local government officials; faith-based, philanthropic, and business leaders; and media representatives. 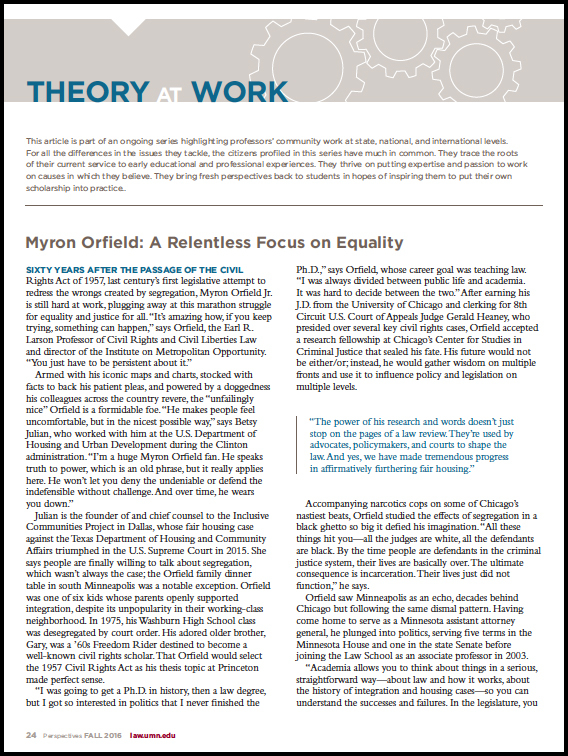 In 2002, with the departure of powell, Myron Orfield, a nationally recognized expert on race, poverty, urban finance, affordable housing and regional reform, was selected to direct the IRP and serve as a professor of law. In 2012, IRP became the Institute on Metropolitan Opportunity (IMO). IMO has continued to build a strong national reputation in race and poverty, as well as a solid academic and theory-based foundation with a renewed focus on regional social, fiscal and growth dynamics. IMO also is integrating the work of the former Ameregis and Metropolitan Area Research Corporation into its operations.